Need to create and share a presentation? If so, you probably turn to the most popular presentation application in the world, Microsoft PowerPoint for Windows. 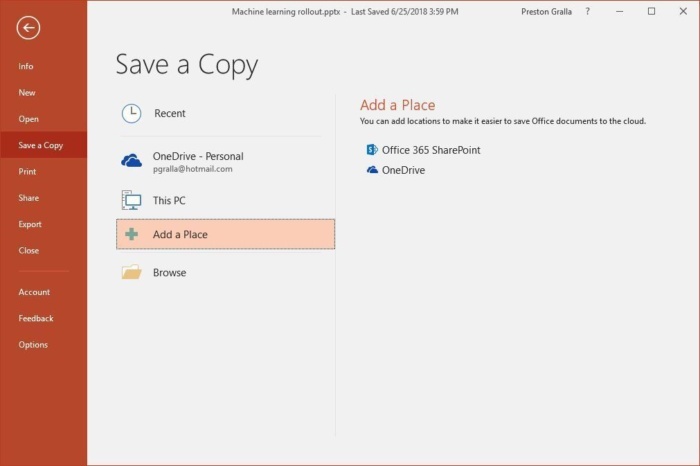 Although Microsoft has just announced the availability of Office 2019 to commercial users, many businesses will stick with Office 2016 (and thus PowerPoint 2016) for some time to come — especially because the company is now saying that Office 2016 users can connect to Microsoft’s online services until 2023. 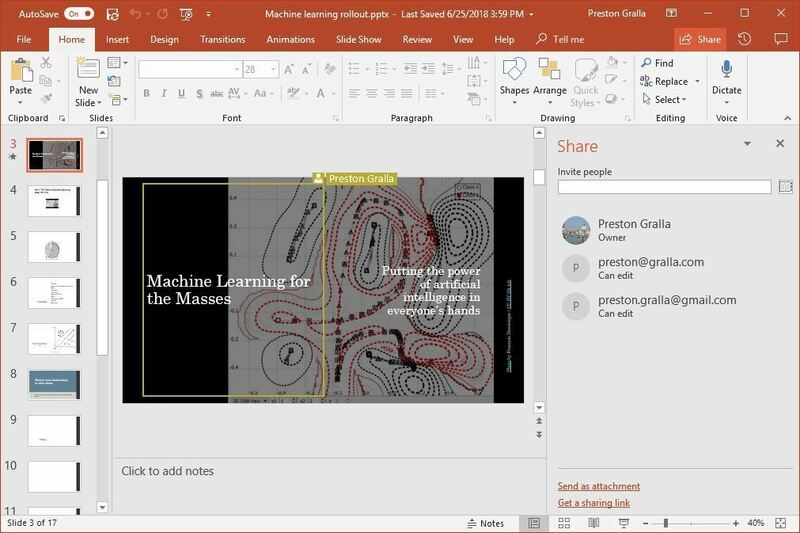 Although you might have been using PowerPoint 2016 for some time now, you might be missing out on some of its worthwhile features. In this story, we’ll clue you in on the most important features introduced in PowerPoint 2016 for Windows. 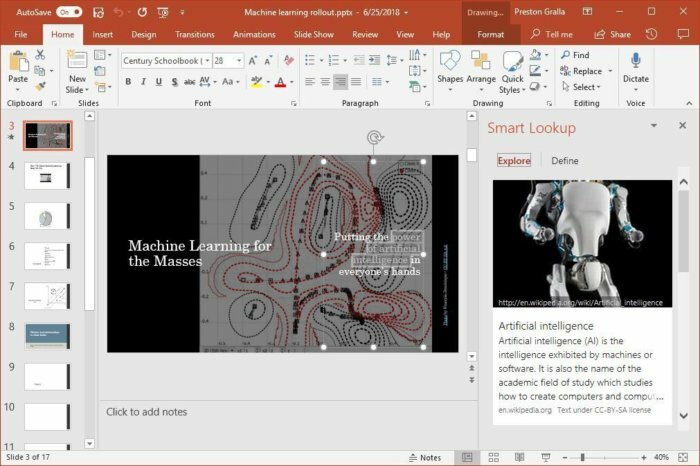 Your copy of PowerPoint 2016 may have been purchased as standalone software or as part of an Office 365 subscription. The subscription version gets continually updated, while the standalone version (which Microsoft calls the perpetual version) stays static. But fear not, we’ve got help for whichever version you use. The first part of the article covers features available in both versions, while the later sections focus on features available only to Office 365 subscribers. Then we wrap things up with a list of handy keyboard shortcuts for all PowerPoint 2016 users. 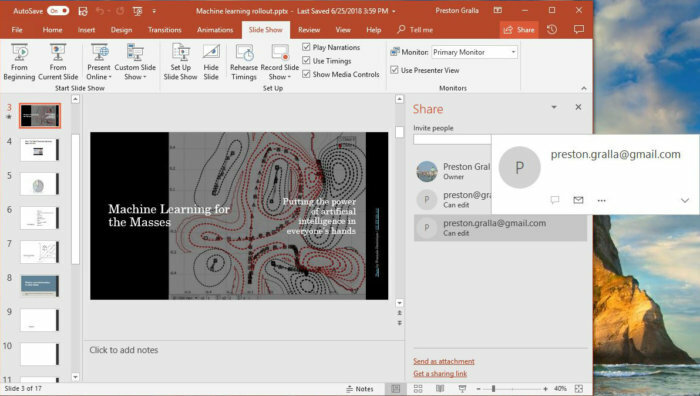 Share this story: IT folks, we hope you'll pass this guide on to your users to help them learn to get the most from PowerPoint 2016. The Ribbon interface that you came to know and love (or perhaps hate) in earlier versions of PowerPoint hasn't changed much in PowerPoint 2016. Because the Ribbon has been included in Office suite applications since Office 2007, we assume you're familiar with how it works. If you need a refresher, see our PowerPoint 2010 cheat sheet. As in PowerPoint 2013, the Ribbon in PowerPoint 2016 has a flattened look that's cleaner and less cluttered than in PowerPoint 2010 and 2007. The 2016 Ribbon is smaller than it was in PowerPoint 2013, the title bar now is now red rather than the previous white, and the text for the Ribbon tabs (File, Home, Insert and so on) is now a mix of upper- and lowercase rather than all caps. But it still works in the same way, and you'll find most of the commands in the same locations as in PowerPoint 2013. To find out which commands live on which tabs on the Ribbon, download our PowerPoint 2016 Ribbon quick reference. Also see the nifty new Tell Me feature described below. As in previous versions of PowerPoint, if you want the Ribbon commands to go away, press Ctrl-F1. (Note that the tabs above the Ribbon — File, Home, Insert and so on — stay visible.) To make them appear again, press Ctrl-F1. And if for some reason that nice red color on the title bar is just too much for you, you can turn it white, gray or black. To do it, select File > Options > General. In the "Personalize your copy of Microsoft Office" section, click the down arrow next to Office Theme, and select Dark Gray, Black or White from the dropdown menu. To make the title bar red again, instead choose the "Colorful" option from the dropdown list. Just above the Office Theme menu is an Office Background dropdown menu — here you can choose to display a pattern such as a circuit board or circles and stripes in the title bar. You can change PowerPoint’s red title bar to gray, black or white: In the "Personalize your copy of Microsoft Office" section, click the down arrow next to Office Theme and pick a color. If you're working in a presentation you've saved in OneDrive or SharePoint, you'll see a new button on the Ribbon, just to the right of the Share button. It's the Activity button, and it's particularly handy for shared presentations. Click it and you'll see the history of what's been done to the presentation, notably who has saved it and when. To see a previous version, click the "Open version" link underneath when someone has saved it, and the older version will appear. There’s also a very useful difference in what Microsoft calls the backstage area that appears when you click File on the Ribbon: If you click Open, Save a Copy, Save or Save As from the menu on the left, you can see the cloud-based services you've connected to your Office account, such as SharePoint and OneDrive. Each location now displays its associated email address underneath it. This is quite helpful if you use a cloud service with more than one account, such as if you have one OneDrive account for personal use and another one for business. You'll be able to see at a glance which is which. You can also easily add new cloud-based services. From the screen that shows you your online locations, click “Add a Place,” and choose which service to add. Note, though, that you’re limited to SharePoint and OneDrive. The backstage area (under the File tab) shows which cloud-based services you've connected to your Office account and lets you connect to additional ones. PowerPoint is so chock-full of powerful features that it can be tough to remember where to find them all. PowerPoint 2016 has made it easier with a new feature called Tell Me, which puts even buried tools or those you rarely use in easy reach. To use it, click the "Tell me what you want to do" text to the right of the Help tab on the Ribbon. (Those who prefer keyboard shortcuts can instead press Alt-Q.) Then type in a task you want to do, such as "change handout orientation." You'll get a menu showing potential matches for the task. PowerPoint 2016's Tell Me feature makes it easy to perform just about any task. Even if you consider yourself a PowerPoint pro, give Tell Me a try. It'll save you lots of time and is much more efficient than hunting through the Ribbon to find a command. It also remembers the features you've previously clicked on in the box, so when you click in it, you first see a list of previous tasks you've searched for. That makes sure that tasks that you frequently perform are always within easy reach, while at the same time making tasks you rarely do easily accessible. If you do research to gather information for presentations, you’ll want to check out another new feature, Smart Lookup. It lets you do online research from right within PowerPoint while you're working on a presentation, so there’s no need to fire up your browser, search the web, and then copy the information to your presentation. To use Smart Lookup, right-click a word or group of words and select Smart Lookup from the menu that appears. PowerPoint 2016 then uses Bing to do a web search on the word or phrase and displays definitions, any related Wikipedia entries, and other results from the web in the Smart Lookup pane that appears on the right. If you just want a definition of the word, click the Define tab in the pane. Smart Lookup lets you do web research from right within PowerPoint. Smart Lookup has been getting smarter over time. When the feature first launched, it wasn’t very good at finding specific, timely information such as the current inflation rate in the United States. It was much better at finding more general information, such as a biography of the artificial intelligence pioneer Arthur Samuel. But Microsoft has done a lot of work on it, and it now works well when finding granular information as well. Keep in mind that in order to use Smart Lookup in PowerPoint or any other Office 2016 app, you might first need to enable Microsoft's intelligent services feature, which collects your search terms and some content from your presentations and other documents. (If you're concerned about privacy, you'll need to decide whether the privacy hit is worth the convenience of doing research from right within the app.) If you haven't enabled it, you'll see a screen when you click Smart Lookup asking you to turn it on. Once you do so, it will be turned on across all your Office 2016 applications. The most important feature in PowerPoint 2016 for those who work with others is real-time collaboration that lets people work on presentations together from anywhere in the world with an internet connection. To do it, you must be logged into your Microsoft or Office 365 account, and the document must be stored in OneDrive, OneDrive for Business or SharePoint Online. To collaborate on a document, open it, then click the Share icon in the upper-right part of the screen. If you haven’t yet saved your file in OneDrive, OneDrive for Business or SharePoint Online, you’ll be prompted to do so. If you’re an Office subscriber, make sure the AutoSave button on the upper right of the screen is switched to On. If it isn’t, you won’t be able to work live on documents with other people. What happens next depends on whether your document is stored in your own OneDrive or with OneDrive for Business or SharePoint Online. 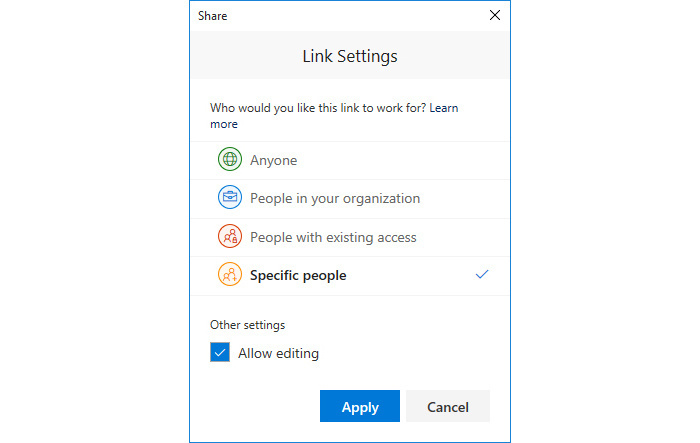 In May 2017, Microsoft rolled out a new sharing interface to enterprise Office 365 users that it says is simpler and gives greater control over who has access to your content. A Microsoft representative told us that the company intends to roll out the newer interface to consumers with an Office 365 subscription at some point, but it hasn’t announced timing yet. 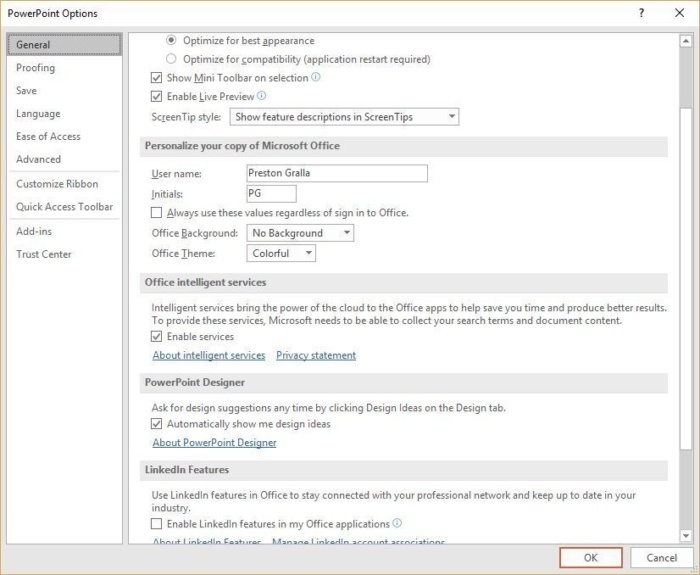 The new interface isn’t planned for non-subscription versions of Office 2016 or earlier. So we’ll give instructions for both interfaces below. If your document is stored in your personal OneDrive: After you’ve saved your document to OneDrive and clicked the Share button, the Share pane opens on the right-hand side of the screen. Think of the pane as command central for collaboration. At the top of the pane, type in the email addresses of the people with whom you want to collaborate on the document, separated by commas. As you type, PowerPoint looks through your address book and displays the matches it finds; click the person you want to invite. If you’re on a corporate network, you can click the address book on the right to search through your corporate email address book. If a person isn’t in your address book, type in the complete email address. After you enter the addresses, select either "Can edit" or "Can view" in the dropdown to allow collaborators full editing or read-only privileges. (If you want to assign different rights to different users, send separate emails, or you can change any collaborator’s permissions later by right-clicking their name in the Share pane.) Type a message in the text box if you want. When you’re done, click Share. 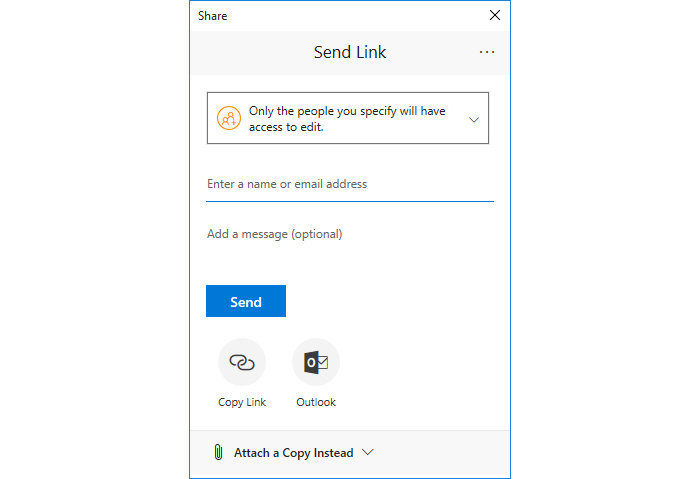 An email is sent out to everyone with whom you’ve shared the file, showing a “View in OneDrive” button that they can click to open the document. 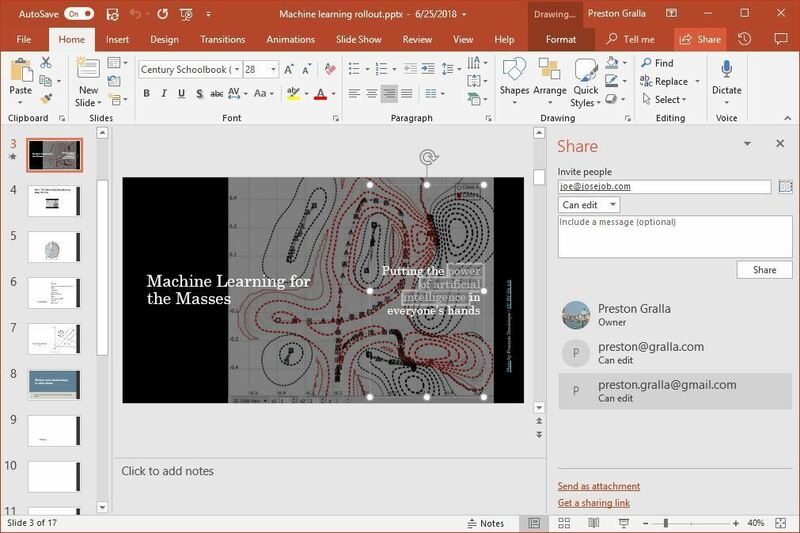 If you want to instead send the file but don’t want to let people collaborate on it, at the bottom of the Share pane click “Send as attachment.” You can then send the file either in PowerPoint format or else as a PDF. When you do this, it won’t reflect any changes you make to it after you send the file. If your document is stored in SharePoint Online or OneDrive for Business: Click the Share button. That pops up a Send Link window. From here you can send an email with a link where others can access the document. Sharing a presentation via the Send Link pane. Enterprise users can fine-tune access and editing permissions for their shared presentation here. Back in the main Send Link window, enter the recipients’ email addresses (as you type, Excel will suggest people from your address book whom you can select), optionally type in a message, and click Send. An email is sent to all the recipients, with a link they can click to open the document. The web version isn’t as fully featured as the client version — for instance, there aren’t as many transitions and animations, you can’t record your screen from inside PowerPoint, and you can’t give slideshows or use several other features. But for basic editing, it works fine. When you're working on a presentation with other people in real time, each person gets a cursor with a unique color. You can see what they do as they do it, including deleting, editing and adding text. They see what you do as well. Here’s what PowerPoint looks like when two people are collaborating on a document. You can do more than see each other’s work. You can communicate as well. The Share pane shows a list of people who have editing access to the document. Those who are currently in the document have a colored bar next to their icon. That bar matches the color of the cursor you'll see as they move around in the document. Hover your cursor over the icon of anyone currently working on the document, and a screen pops out with the various ways you can contact that person, including text chat, phone and video via Skype (if the person has Skype) and email. That lets you talk or text while you're working on the document together, making collaboration that much more effective. Click the icon of someone working with you on a document to see other ways you can contact that person.